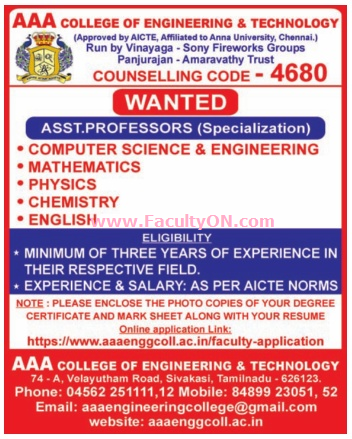 AAA College of Engineering and Technology, Sivakasi has advertised in the DINAMALAR newspaper for recruitment of Assistant Professor jobs vacancies. Interested and eligible job aspirants are requested to apply as soon as possible from 29th July 2018. Check out further more details below. About College: AAA College of Engineering and Technology, Sivakasi is one among the renowned colleges for technical education in the Crackers City. It is branded for its quality education, promoted by Sony-Vinayaga group of Industries. Aspire, Attain, Achieve is its logo. The college is managed by Panjurajan- Amaravathy Trust located at Thiruthangal, Virudhunagar District. How to Apply: Interested candidates are requested to send application along with CV, copies of certificates and recent passport size photo to the postal address provided below or apply online at the web link given below.